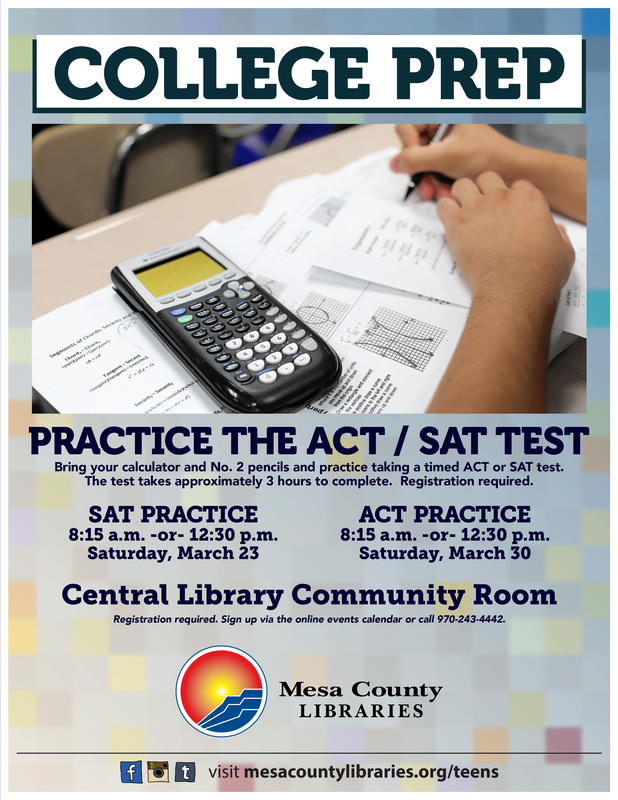 Students who want to warm up for the SAT and ACT exams are invited to take practice tests at the Mesa County Libraries Central Library on March 23 and 30, 2019. There is no charge to take the practice exams, but seating is limited and preregistration is required via the links below or by calling 970-243-4442. Practice tests for the SAT exam will be offered at two separate times: 8:15 a.m. and 12:30 p.m. Saturday, March 23, in the Central Library Community Rooms, 443 N. 6th St. in Grand Junction. The tests will be paper format. The essay portion will be handed out to take home but will not be administered. Please bring a calculator and a No. 2 pencil. The practice test takes approximately three hours to complete. The tests will begin promptly at the scheduled time, so please arrive early. Practice tests for the ACT exam will be offered at two separate times: 8:15 a.m. and 12:30 p.m. Saturday, March 30, in the Central Library Community Rooms, 443 N. 6th St. in Grand Junction.